I'm on this new rotation at work of actually having every weekend off and it's pretty awesome! *update* apparently, it's not going to last long, as the powers that be have realized that they need me there on weekends. lame. Anyways, on a typical Saturday morning, if I'm not at work, the three of us head out to the farmer's market down the road for some fresh veggies and maple scones (mmmm). On Friday evening, Jackie noted that there was going to be a Vintage Fair at a local farm, and that we could forego the usual farmer's market to switch it up a bit. When we arrived bright and early on Saturday morning, it was packed! And there was so many old treasures to see: old china, jewelry, furniture, and even services like photography were present. It was definitely a neat experience. The trail between booths was covered in loose gravel, and not ideal for a stroller... So, we'll just keep note of that for next year. 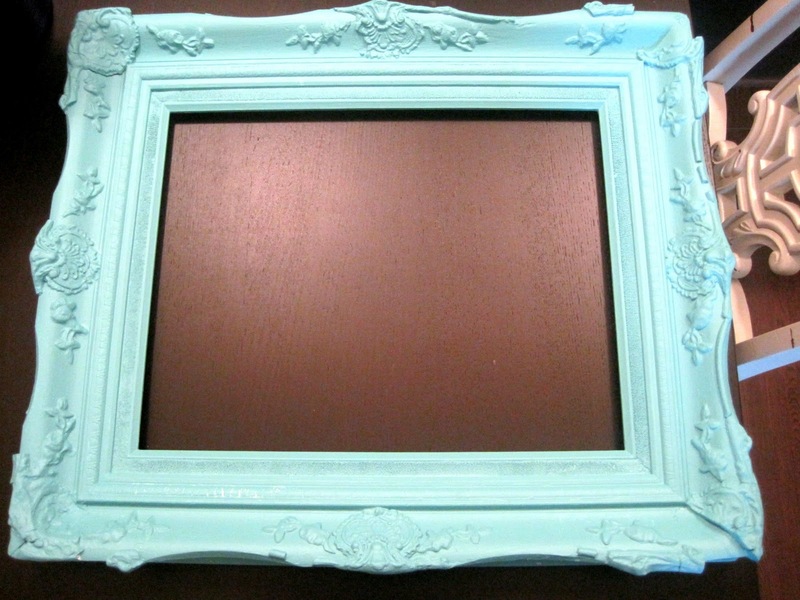 I've been trying to keep an eye out for an embellished picture frame for quite some time, but the ones I usually find at thrift stores are either too costly, or aren't embellished enough. 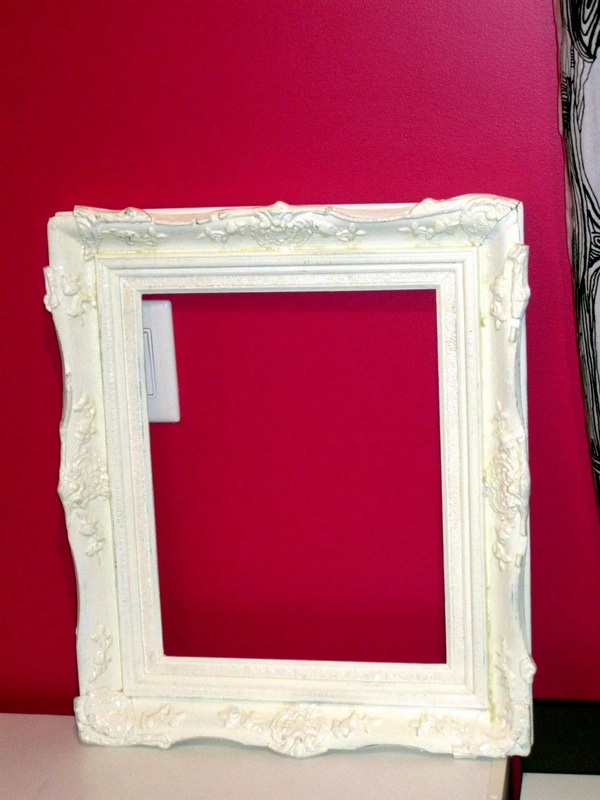 What I loved about this one was that it looked worn, and literally had chunks of the frame missing- it added so much character! So, I splurged, and bought it for $20. Check out the hot painted burgundy velvet! I started off with the primer. 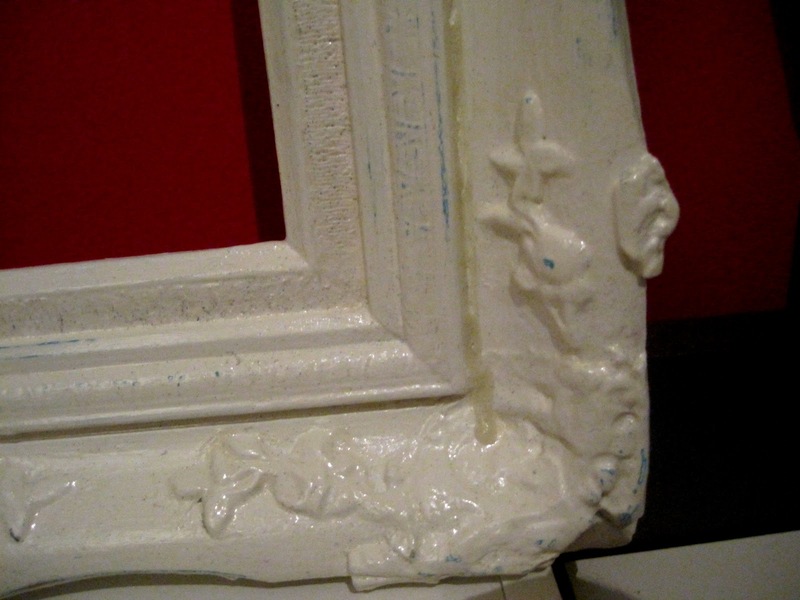 I cannot stress enough how important primer is. 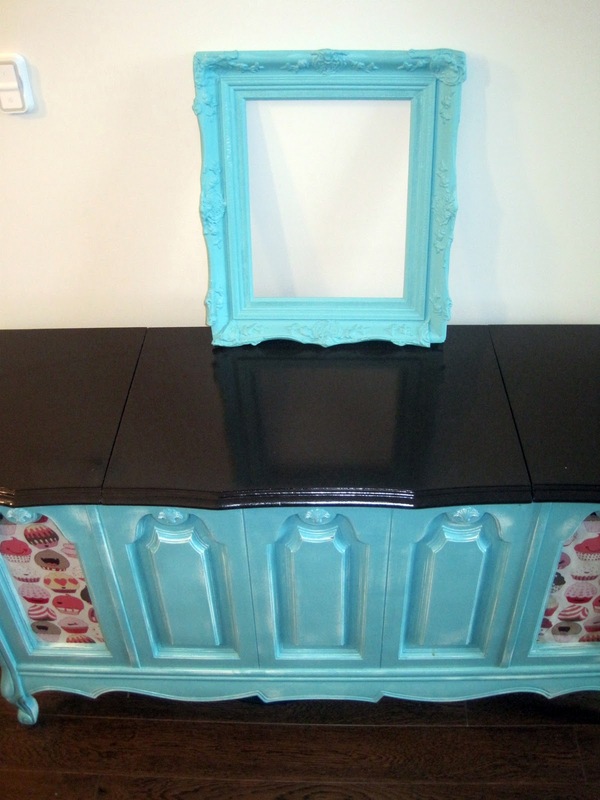 For both my painted door and our dining chairs, I chose to skip the priming step because I was either using oil base paint, or a paint with a built-in primer. And now paint is generously peeling off both projects! And so: No excuses! ALWAYS use a primer if you want your top coat to last! 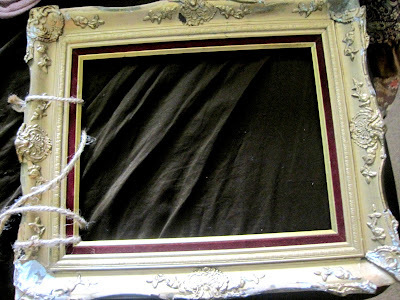 It was especially "fun" to paint the burgundy velvet trim that surrounded the inner perimeter of the frame... very fun, indeed. 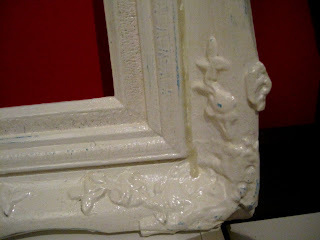 After the primer coat, I painted 1 coat of Peacock Blue (the same color I used on one of the distressed hooks). To dry, I set it down on top of Hazel's Toybox... and, I couldn't believe my eyes- it was the exact same color! 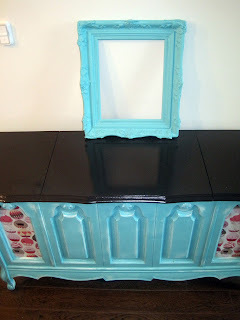 Let me explain: as I mentioned, the frame was painted in Peacock Blue (Benjamin Moore color), and the toy box was painted in Lagoon (Martha Stewart color), and they're almost identical! I must really be drawn to that color! It just bums me out a bit- I love color, and strive to incorporate different variations through every project... and to re-use color can often be a bit of a downer. Oh well. Peacock Blue vs. Lagoon: Can you tell the difference? 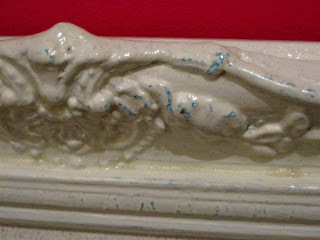 I covered the blue with 2 coats of White Chocolate paint (mmm, good enough to eat!) 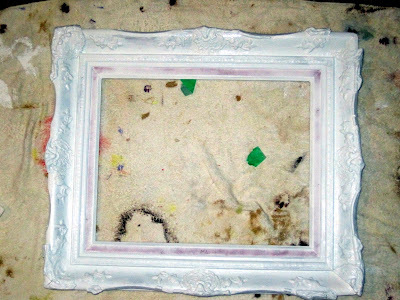 and lightly sanded- just barely, to give it a very subtle aged-feel. Following the sanding (and the hour trying to remove the loose sand from the crevices of the embellished frame), I busted out the water based high gloss varathane, and gave it 3 thick coats, and the frame literally looks wet! Awesome! I think we'll wrap it up at that for today. 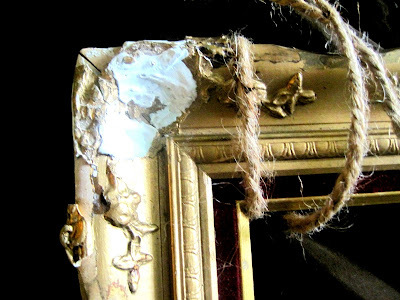 The next step for this frame is for me to try and fashion a backing to support the picture, as well as to find some eye hooks and wire to mount the frame- but that's a different story, for another day. Distressed peaks of blue with a full gloss sheen! Love it!